Last weekend, nearly 200 participants inhabited the Manhattan workshop space General Assembly for a weekend-long marathon of hacking solutions to the dilemmas facing dining today. Called Hack//Dining NYC, the event was the latest in the series of hackathons hosted by Food+Tech Connect, founded by Danielle Gould. 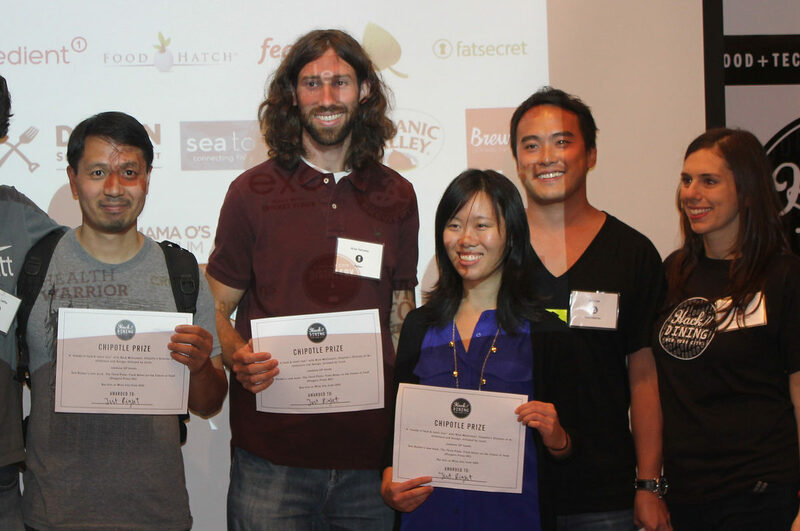 Previous hackathons have focused on Meat (Hack / Meat) or the Farm Bill (Farm Bill Hackathon). Through these and other events, Food+Tech Connect has garnered a following from both the tech and food communities eager to find more advanced ways to address today’s food system challenges. “Whether at home or out, everyone dines. We wanted to focus on an area that has a huge impact on the economy, environment and public health, and dining fits that profile,” said Gould of the inspiration for Hack//Dining. Applegate: How might we use technology to empower customers to better communicate their food preferences to foodservice establishments and suppliers? Batali & Bastianich Hospitality Group: How might we use technology to make it easier for restaurants to comply with and maintain food safety regulations? Chipotle: How might we use technology to enable quick service restaurants to better measure and manage their actions to operate in a more environmentally sustainable way? Google: How might corporate foodservice use technology to help people make food and behavior choices that allow them to achieve their personal and professional lifestyle goals? After two days of hacking it out, the teams are narrowed down to three finalists for each challenge, which present before a panel of elite judges. This time around, the judges included Dave Arnold of Booker and Dax; Wylie Dufresne of wd-50 and Alder; Richard Corraine of Union Square Hospitality Group; Esther Dyson of EDventure Holdings & HICCup.co; Jessica Lawrence of NY Tech Meetup; Naveen Selvadurai of Expa Capital; Dorothy Cann Hamilton of International Culinary Center; and Victor Friedberg of S2G Ventures. How well did the groups answer the challenges? There was much enthusiasm and continued conversations by the end of the long weekend. This was a seasoned group of hackers. Holley Atkinson, a volunteer, estimated that a large majority of the participants at Hack//Dining had done hackathons before. And rather than pinpointing the “One Right Product” to answer any of these challenges, the event seemed to spur communication and teamwork amongst all those involved. Those more attuned to the food policy and sustainability-driven ethos of previous Food+Tech Connect events might have been underwhelmed by some of the ideas at Hack//Dining. Participants were each given a handbook encouraging them to work on innovations that might affect the overall food system for the better. Mike Lee of Studio Industries (who also emceed the final pitches alongside Gould) worked with each sponsor to carefully craft challenges that would benefit everyone, rather than be company-specific. “We really try to emphasize against making tech for tech’s sake,” said Lee. Still, some groups seemed to miss the mark of the most pressing challenges concerning dining today. When presenting an app that would allow workers to vote on the quality of catered lunches at work, judge Dufresne asked the group, “Is this actually a problem that exists or is it just creating one?” The developers answered earnestly that their app stemmed from everyday experience, which was the motivation for their design. Chatting with other participants, I learned that early into the hackathon, many groups also trying to solve the Applegate challenge found themselves making essentially a Yelp for a niche food service sector and starting over. But company and college campuses are not to be overlooked as a “niche” amongst the food system; an estimated 20 million people eat from the same two food service providers at workplaces five times a day. Making changes within their systems can have a great potential impact on the way we produce, prepare, and distribute food. The group which presented Rumble, a product that could allow college student to voice their food preferences to the foodservice providers in a fun and social way, won the Applegate challenge. The challenge presented by Batali & Bastianich Hospitality Group asked developers to improve and streamline the food safety inspections of restaurants. The team who presented Food Safety Mapping had spent the better part of the weekend extensively researching food safety issues nationwide and how they’re reported. Their final concept attempted to collect and use more consistent data that could connect the dots between disease outbreaks and restaurant food safety inspections. Another team in this challenge devised an app for more immediate action: in their own words, the “Turbo Tax for passing food safety inspections.” The app, Kitchen Check, could instruct and update restaurants on the laws concerning their state’s food regulations, as well as provide community and tools for restauranteurs. Judge Corrine chuckled when asking the presenters: “But if I fail the inspection, will you go down with me?” The team behind Kitchen Check won the challenge anyway. Two of the three groups in the final round of pitches for the Chipotle challenge centered their solution on reducing food waste, citing the large portions packed into burritos by the chain that often got thrown away by full diners. One, “Just Right,” allowed patrons to customize the size and ingredients in their order from the line at the restaurant, so that when they strolled up to the counter, their order would be ready, and the transaction simple. But Dufresne played Devil’s Advocate: “You’re creating more work for the line cook,” he insisted. “He’s in the weeds, and he doesn’t care about Suzie’s order.” The group argued that the app would spare the chain food waste and hence save them food costs, as well as create loyalty thanks to a built-in program where customers would receive a free burrito after using the app to a certain threshold. The judges seemed at once irritated, aghast, and very intrigued by this product. Maybe that’s a good sign at a hackathon; the team behind Just Right won the challenge. Perhaps not every food and dining-related problem needs a tech-based solution. One participant, Yangbo Du, created a system with his team for composting food waste at Chipotle, but didn’t make it to the finals. He admitted after viewing the final pitches that it didn’t have a strong enough tech component. The pitches for the final challenge of the day, Google’s, seemed to raise more concerns about privacy than any previous challenge. The winner of the challenge created an app called Hive, which would serve as a personal trainer for your smartphone, with customized advice and a social network to share personal goals and receive congratulations. Overheard banter about the room suggested that many thought the app was asking a lot from the user in terms of sharing. But it would be much cheaper than hiring a trainer. Prizes were handed out to each winning team, donated by the sponsor of their challenge. At the end of Hack//Dining, it seemed like just the beginning of the journey for many participants. Mike Caprio of the Food Safety Data Mapping product vowed he and his team would continue the concept, estimating that it could take a few months before any product was formed. Many others were newly enthused about refining their product, either because their pitch didn’t win the challenge, or it did. “There were a number of products that came out of Hack//Dining that are readily usable in the real world, and that’s one of the key indicators of success for this type of hackathon,” said Lawrence. But which one was “the best?” The judges didn’t choose an overall winner of the hackathon. So I asked folks around the room. While this is a very subjective question, and is limited to the challenges presented, many responded that the best pitches of the evening were those that had the most potential. Potential to just do something, I gathered. Editor’s Note: Last week, we ran a related op-ed looking whether tech is always the right solution for food systems. These "hacks" to improve future of food are eerily reminiscent of those found in Dave Eggars "The Circle". I guess that precautionary sci-fi tale isn't fiction any more.